Europe's tiny, washing machine-sized lander robot lab Philae, hurtling through space on the back of a comet, awoke overnight and sent home its first message in nearly seven months, mission officials said Sunday. Jubilant that the nail-biting wait was over, they declared Philae may soon resume science work, opening up a new chapter in its exhilarating voyage. "We got a two-minute… successful communication" at 2228 Central European Time (2028 GMT) on Saturday, mission manager Patrick Martin told AFP from the operations centre in Madrid. "This was sufficient to confirm that Philae is healthy and that its sub-systems are OK in terms of energy and temperature for ongoing communication with Rosetta," he said, referring to the lander's mothership orbiting Comet 67P/Churyumov-Gerasimenko. The mission seeks to unlock the long-held secrets of comets — primordial clusters of ice and dust that scientists believe may reveal how the Solar System was formed. Philae, equipped with 10 instruments, may now get a grandstand view of the gas, dust and icy crystals that blast from the comet as it gets ever closer to the Sun, scientists hope. Perihelion, the closest point to the Sun in the comet's orbit, will be on August 13, after which "67P" will veer off again into the deeper reaches of space. Philae touched down on the comet on November 12 after an epic 10-year trek piggybacking on Rosetta. But instead of harpooning itself onto the iceball's surface, the lander bounced several times before settling at an angle in a dark ditch. It had enough stored battery power for about 60 hours of experiments, enabling it to send home reams of data before going into standby mode. The hope was that better light as the comet approaches the Sun would recharge Philae's batteries enough for it to reboot, then make contact, and ultimately carry out a new series of experiments. But three bids to make contact, in March, April and May, all came to nothing. "We were surprised, yes, because we didn't expect it at all last night, on a weekend — it's really exciting," Martin said. "Philae is doing very well," said Stephan Ulamec, Philae project manager with the German space agency DLR. "The lander is ready for operations." Martin was more cautious, saying: "We have already lined up more communication windows which hopefully will see a repeat of this successful communication. "If we get a stable communications pattern we should be able within a week or so to think about operating the instruments on board the lander." A tweet in the name of Rosetta announced: "Incredible news! My lander Philae is awake! ", before prompting the robot to "take it easy for now" while checks are run to see that it is "fit, healthy and warm enough". 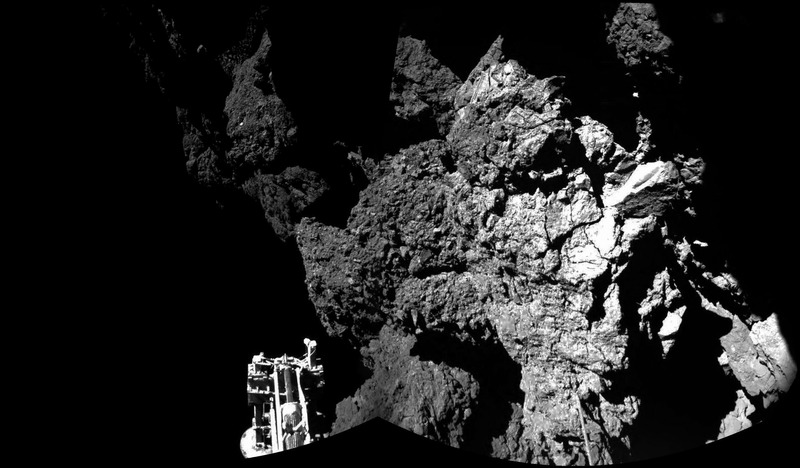 This prompted a Twitter response from Philae: "Oh, OK… I'm still a bit tired anyway… talk to you later!" The news was welcomed from far and wide, with NASA tweeting "Rise and shine!" while Britain's usually staid Royal Observatory shouted: "YES!!!" Monica Grady, a scientist working on one of Philae's instruments, tweeted: "I'm in tears again… can it be true?" ESA posted a cartoon version of Philae, stretching its arms and yawning as it wakes up next to its camping gear, with the Sun peeking out from behind a rocky cliff now only partly shading the little lander, and Rosetta hovering on the horizon. The comet and its precious cargo are 215 million kilometres (134 million miles) from the Sun and 305 million km from Earth, racing at a speed of 31.24 km a second, according to ESA's website. Philae's operators hope that the new data will allow them to pinpoint the lab's exact location on the comet, which has so far been narrowed to an area of about 100-200 metres (328-656 feet).